Recounted with his usual level of meticulous historical research, Rod weaves an easily readable account of the build-up to and implementation of Operation Desecrate 1 – the raid undertaken to destroy Japanese ships and aircraft in the lagoons of Palau. He uses his intimate knowledge of shipwrecks to reveal in glorious detail each of the 20 major Japanese WWII shipwrecks lying at the bottom of the Palauan lagoons today. Today, 20 major Japanese WWII shipwrecks lie in the beautiful clear waters of the tropical paradise of Palau surrounded by reefs and coral wall drop-offs. A number of long-lost wrecks have recently been relocated including a Japanese freighter filled with depth charges and Army helmets. This was found in 1989 but remained unidentified until now – after painstaking research Rod reveals her identify for the first time in the book. Each wreck is covered in detail and is supported by underwater photography and by fabulous illustrations by renowned artist Rob Ward. 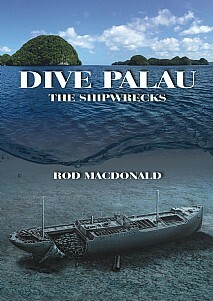 The shipwrecks of Palau are now revealed.